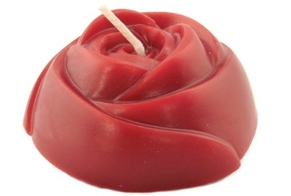 Rose candles combine the wonderful qualities of 100% pure beeswax candles with the beautiful ornamental shape of the rose. A long-lasting burn with a soft, warm glow, along with a soothing aroma and natural scent, Honey Candles® Rose Candles are perfect for adding flavour to every romantic occasion, or simply relaxing at home or in the bath. Like all of our 100% pure beeswax candles, Honey Candles® Burgundy Rose Candle is environmentally-friendly and good for your health, with absolutely no carcinogens or hazardous ingredients, wicks made with cotton, and all natural ingredients. The soft honey aroma carries compounds proven to neutralize airborne allergens and toxins. Plus, beeswax candles produce a natural glow that very closely resembles sunlight. You'll love the unique quality of bee wax candles.